I don’t know about your home, but my daughters playroom always the messiest room in the house. I’m sure this is because she has the most stuff of anyone in the house ha! It seems like everyday there are more and more toys that are on the floor, piled up in in corners, and overflowing out of toy boxes. So I knew something had to be done and I thought I would share some easy tips for organizing a playroom that I learned along the way! 1. Twice a year do a purge of toys – Before Christmas and before her Birthday we do a purge of toys that are no longer played with. Kids taste in toys change so often and I promise that there are toys they don’t want in there. If it hasn’t been played with in a few months, toss it, sell it, or donate it. 2. Storage, Storage, Storage- We have a clear storage bin for bigger toys, a hanging storage system for stuffed animals, and clear drawers for barbies and smaller toys. Every toy has a place and somewhere to go back to when it’s not being played with. 3. Use an over-the-door shoe organizer for toys- This is one of my favorite organization tips! Over-the-door shoe organizers are the perfect size for barbies, machbox cars, or art supplies! 4. Hang up Dress Up Clothes – Rather than throwing dress up clothes in a storage bin which will take up more space, hang them on the wall! Not only will it be easier to get to and put away, it also looks really cute and decorative! 5. Make sure your kids pitch in- When it’s time to clean up the playroom, make sure your kids take an active role in the clean up process. Once they know what work goes into keeping the space clean, they are more likely to keep it cleaner during the week! 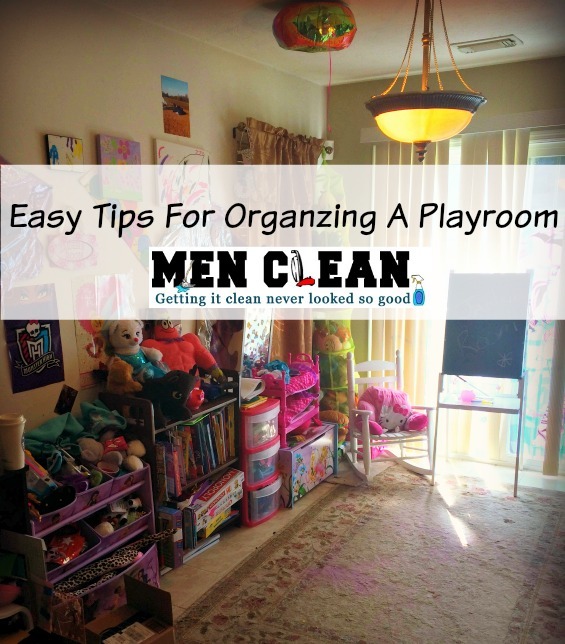 Do you have any tips for organizing a playroom? I'm a cleaning, stain fighting, hands on dad who likes to work out, cook, and fix my truck.